Lush are one of the brands I know will do really good collections when there is a holiday or theme to a particular time of year. I loved the mothers day collection and I was so glad they don't forget the men in our lives by bringing out a couple of products for the fathers day holiday that is closely looming! Having quite a cool collection, out but knowing I wouldn't be able to bath after my surgery for a while I resigned to just one product from the range to review and if you know me you will know it had to be the bath bomb! I think my dad would use this, but I kind of hijacked it as, well I want to review it! I might buy him one though as part of his gift. 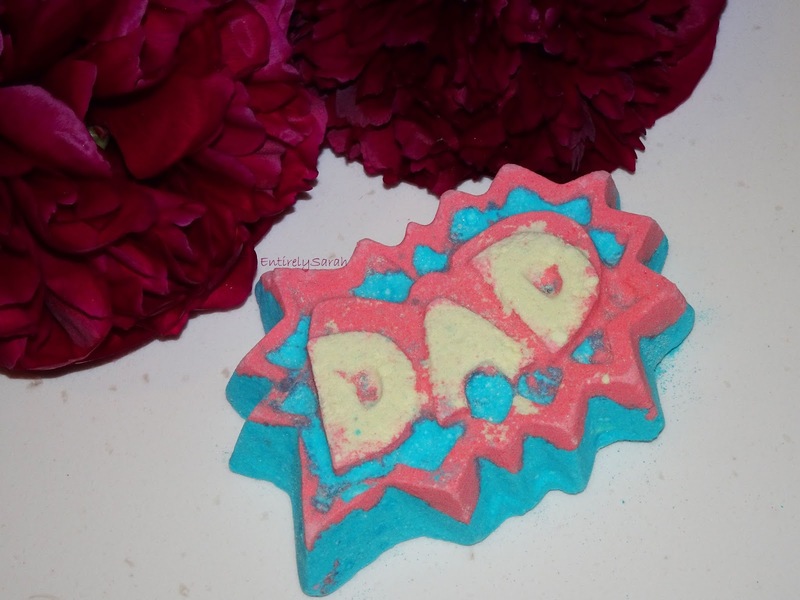 The bath bomb reminds me of the old school comic books with the BAM, BOOM, SMASH, graphics written in graphic lettering for dramatic effect and being called Super dad it makes it relate back to the ideas of Superman and the comic series. It is such a cool bath bomb and the striking blue, red and yellow design is really quite eye catching and lovely. That bath bomb is quite striking and eye catching and looks lovely which is really good as it draws you in. The bath bomb has s sandalwood scent to it and I feel like although it is definitely still unisex, it has a lovely masculine scent that makes me think of male aftershaves. I know this is a scent my dad would enjoy, and so would my husband so it would make a lovely bath bomb for any male, if we excuse the fact it says dad on and may be a bit weird if I bought my non dad husband a bath bomb that said dad on it, I think it would raise a few questions. This was a slow fizzing bath bomb, I really love that it took ages to fizz away turning the water blue as it fizzed away. It was so slow fizzing that I could climb in the bath and it still be fizzing a good ten minutes later! Maybe I got a particularly slow fizzing one, so maybe do bare in mind it may have a slightly faster fizz, but mine was on the slower side! The bath bomb turned the water a standard blanket colour that was a lovely mid blue and didn't have any glitter or shimmer in, which is probably a good thing as my dad would hate that, and so would my husband. I love the colour it made the water though it reminded me o the blue sea and just was so nice to relax in. At £3.95 this is such a brilliant gift to either gift for fathers day or to add with a few other things to make a lovely gift that I am sure your dad will love. I find Lush is such good value and if your dad isn't one for taking long baths you could even break this in half and get two uses from it, as I know my husband likes to be in and out of the bath as soon as he is washed, he much prefers a shower! I think this is so lovely and you can find it on Lush here if you want to know more about it. I'd love to know what you are thinking of getting your dad for fathers day, so let me know in the comments!